Belief in metempsychosis or the transmigration of souls into other living beings is ancient. In Western tradition, one of the most common sites for a formerly human soul to inhabit is that of a bird. Such birds are invariably also ominous, in its original sense of prophetic, the rationale being that the dead, as spirits, know both past and future. They are ominous also in its secondary meaning of "boding ill."
At sea, such soul birds include the storm petrel ( Hydrobates pelagicus ). Storm petrels, as their name suggests, were taken as a sign of approaching bad weather, so sailors saw them as helpful and considered it unlucky to shoot one. Moreover, into the nineteenth century, perhaps later, many seamen believed that petrels should be spared because they harbored dead sailors' souls. Seagulls ( Laridae ), too, warned of approaching storm. An extension of this was the belief that they cried before a disaster. As with petrels, in West European fishing communities it was thought unlucky to kill a gull; and, as with petrels, some said they embodied the souls of fishermen and sailors, especially those who had drowned. Belief in gulls as soul-birds was still active in coastal districts of Great Britain and Ireland up to at least the late nineteenth century. Other birds were also thought to house souls. Among East Anglian fishermen, the spirits of the drowned were believed to migrate to the gannet ( Morus bassanus ). From the eastern seaboard of the United States comes the story of a waterman on Chesapeake Bay who shot three ducks as they flew in to land. They fell into the marsh, and he could not find them. That night, a gale sprang up and blew for three days. When it was over, he returned to the marsh and in the water, where the ducks fell, lay three drowned sailors. In the nineteenth century soul birds, such as petrels, gulls, and albatrosses, were considered useful because they were a sign of approaching bad weather and, as their name suggests, carried the souls of drowned fisherman and sailors. both storm petrels and shearwaters were known as âmes damnées ("souls of the damned"), the subtext being that, like some ghosts, part of their punishment after death was to continue to haunt the earth. 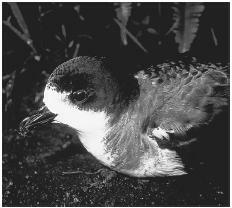 Muslim seafarers in the nineteenth century similarly said that the Manx and Mediterranean shearwaters ( Puffinus puffinus and Puffinus yelkouan ) of the eastern Mediterranean were inhabited by damned souls, a belief possibly suggested by their dark plumage. Coleridge is said to have based the mariner's shooting of the albatross—an act that brought doom on his ship—on an episode in Shelvocke's Voyages (1719). But in Voyages the bird was a black albatross, shot by someone who "imagin'd, from his colour, that it might be some ill omen." Whether or not the superstition against shooting albatrosses generally began with Coleridge, it was never widespread: They were regularly shot at by ships' crews, who, among other things, made their webbed feet into tobacco pouches. On land, the themes of ominousness and transmigration are attached to corvids, specifically crows and ravens, which were not always distinguished. From classical times to the present day, the raven ( Corvus corax ) and crow ( Corvus corone ) have been thought birds of ill omen. A document written in England between 680 and 714 C.E. reported that once, when King Edwin (585–633 C.E. ) was on his way to church, a crow "sang with an evil omen." The king stopped to listen until Bishop Paulinus had a servant shoot the bird. He later showed it to the catechumens (converts before baptism) in the church to prove that heathen superstitions were worthless, since the bird did not know it was its own death that it was prophesying. This taboo against killing ravens was still current in Cornwall at the end of the eighteenth century, when a young man walking on Marazion Green, near Penzance, with his "fowling-piece" on his shoulder, saw a raven and fired. An old man nearby immediately rebuked him, saying that he should not have shot at the raven because Arthur lived on in that form. King Arthur is the archetypal protector of Britain, and there is probably a connection between this tradition of his transmigration and the custom of keeping six ravens at the Tower of London, instituted by King Charles II (1630–1685). The ravens are a palladium (national talisman); it being said that, so long as there are ravens at the Tower, Britain cannot be conquered. Some anxiety was caused during World War II by rumors that the ravens had fallen silent and had not croaked for five whole days. Armstrong, Edward A. The Folklore of Birds, 2nd edition. New York: Dover, 1970. Beck, Horace. Folklore and the Sea. Middletown, CT: Wesleyan University Press, 1973. Cervantes, Miguel. Don Quixote, translated by Walter Starkie. New York: Signet Classic, 2001. Collingwood, R.G., and J. N. L. Myres, eds. English Historical Documents I: Roman Britain and the English Settlement, 2nd edition. Oxford: Clarendon Press, 1937.